Nine families are suing Wal-Mart and bicycle maker Dynacraft. The lawsuit claims Dynacraft bicycles sold by the retail giant were defective, causing the front wheels to pop off, which sent kids face-first into the pavement. , the families want the bikes recalled. According to Koeppen, Wal-Mart is the No. 1 seller of bicycles in this country. Nearly 500,000 of the bikes in question were sold at Wal-Mart stores across the country. The families who are suing say they don't want other children to be injured. Cathy and Darrell Belyeu are among the families that are suing. They say they never imagined the bike they bought their son at Wal-Mart would lead to a terrible accident. But it did, they say, when the front wheel suddenly popped off. They say Colton flew over the handlebars and hit the pavement head-first. "All I could see was his face, just bloody, all the skin torn off all the way down to his neck, and he's just sitting there in a state of shock, and all I could think of was to just scoop him up and hold him," recalled Darrell Belyeu. Colton suffered second and third degree burns on his face, a broken nose, and a concussion. His case isn't isolated. According to Koeppen, other children have been in similar accidents on these bikes, all of which came with a quick-release lever for the front wheel. The Belyeus and the other families in the lawsuit claim the quick-release levers were defective, causing the front wheels to come off without warning. "All of these incidents are so similar, the way these wheels pop off," said Cathy Belyeu. "I mean, this is a child's bike, it's bought in a toy store area of the store." In deposition testimony, a former Wal-Mart claims adjuster says she saw a pattern of these accidents. She blamed them on improper use and maintenance of the quick-release levers by the kids and their families. She reported this pattern to her superiors and to Dynacraft. Both Wal-Mart and Dynacraft deny that the bikes are defective and blame the accidents on parents and kids tampering with the quick-release levers. But Mark Webb, an attorney for the families, says this is a conspiracy of silence. "They had a duty to let people know that there is a danger out there and that children could get very badly hurt, and instead of doing that, they did nothing," he said. 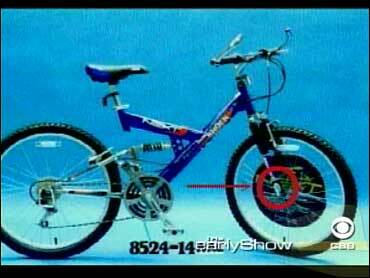 Wal-Mart stopped selling these bikes in 2001, but parents of injured children want to warn others who may still have them in their garages. For more information, visit the Web site of a group called Stop Hurting Our Kids. Editor's note: On February 9, a jury found Wal-mart not guilty of selling defective bicycles. In a statement to The Early Show, Wal-mart said, "We are pleased that this jury overwhelmingly agreed that every allegation in this case was unsubstantiated and reinforced that these bikes were safe and not defective. It is unfortunate when anyone is hurt in a bike accident, but these allegations simply had no merit."